Michel Barnier said the UK white paper opened the way for "constructive discussions"
The EU's chief Brexit negotiator has questioned whether Theresa May's proposals for customs arrangements are workable. 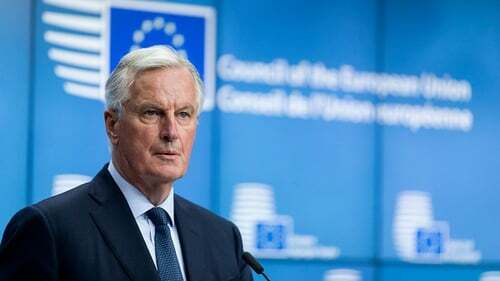 Speaking after briefing ministers from the 27 remaining EU states in Brussels, Michel Barnier said the UK’s white paper has opened the way for "constructive discussions" on the post-Brexit relationship between the EU and Britain. And he indicated the EU was ready to amend its "backstop" proposals for the Irish border, which have become the biggest stumbling block in talks. But he said there were elements of the plan agreed by the British cabinet earlier this month at Chequers which the European Commission did not understand, and said further discussions would be needed over the coming weeks to establish how much "common ground" exists between London and Brussels. Mrs May's proposal for a "facilitated customs arrangement" opened up the risk of major fraud, additional bureaucracy and damage to EU businesses, he said. Mr Barnier insisted that future talks would be based on the guidelines issued by the European Council in March - which included the controversial proposal to keep Northern Ireland in the EU customs union - and not on Mrs May's document. "There will be a deal if there is an agreement on the backstop," said Mr Barnier. "It's not necessarily our backstop. We can work on this, amend it, improve our backstop - the one that the Commission proposed on behalf of the Union. "Technically we feel that it's workable, we can improve it further, we can work on it. We are doing that work. "But we need an operational backstop now, in the Withdrawal Agreement, and not later." Earlier, the British Prime Minister said that the European Union must now evolve its Brexit position, as she ruled out the free trade deal on offer, saying that it created a border between Northern Ireland and the rest of the UK. Speaking in Belfast, Theresa May said that as the UK leaves the EU, her government has made protecting and strengthening "their own precious union ... an absolute priority" by making sure the deal it strikes works for every part of the UK. She stated that Northern Ireland was an "integral part" of the United Kingdom but said that the reality was that any Brexit agreement would have to provide frictionless trade across the border. Mrs May said the EU and the UK must work together to solve the border issue, and she had a duty to ensure Brexit works for the whole of the UK, including Northern Ireland. She said: "I believe in the partnership of our four great nations in one proud union and I want it to endure for generations to come. "A government I lead will never be neutral in our support for the union. We will always make the case for it." Mrs May said that the concept of a hard border between Northern Ireland and the Republic of Ireland was now "almost inconceivable". She said: "In the Northern Ireland of today, where a seamless border enables unprecedented levels of trade and co-operation north and south, any form of infrastructure at the border is an alien concept. "The seamless border is a foundation stone on which the Belfast Agreement rests, allowing for the just and equal treatment for the identity, ethos and aspirations of both communities. "Anything that undermines that is a breach of the spirit of the Belfast Agreement - an agreement that we have committed to protect in all its parts and the EU says it will respect." Her confidence-and-supply deal with the DUP has allowed her government to deliver key decisions important for the whole of the UK, she said. Mrs May said the White Paper policy document can move the Brexit negotiations on, as the text for the backstop produced by the EU was not acceptable and the backstop should not be necessary as the British government had new proposals. Mrs May said the White Paper set out a "principled and practical" Brexit. She said the rules that cover goods had been relatively stable over the last 30 years and many were set by international bodies that the UK will remain a member of after Brexit. Many businesses would continue to meet the rules anyway, she added. In a swipe at former foreign secretary Boris Johnson's call for a "maximum facilitation" customs system for the border, Mrs May said: "No technology solution to address these issues has been designed yet or implemented anywhere in the world, let alone in such a unique and highly sensitive context as the Northern Ireland border." She said that those who say the UK should simply declare it will not impose any checks at the border after Brexit and leave the EU to decide whether it wanted Ireland to erect barriers on its side were "wrong on two levels". "This issue arises because of a decision we have taken," she said. "We can't solve it on our own but nor can we wash our hands of any responsibility for it, so we must work together to solve it. "Like any country sharing a land border with another nation, we have a duty to seek customs and regulatory relationships with each other to ensure borders work smoothly. In Northern Ireland that presents a particular challenge. The protection of the peace process and upholding our binding commitments in the Belfast Agreement are grave responsibilities. "Not to seek a solution would be to resume our career as an independent sovereign trading nation by betraying commitments to a part of our nation and to our nearest neighbour. The reality is that any agreement we reach with the EU will have to provide for the frictionless movement of goods across the border. "Equally clear is that as a United Kingdom government, we could never accept that the way to prevent a hard border with Ireland is to create a new border within the United Kingdom. To do so would also be a breach of the spirit of the Belfast Agreement."